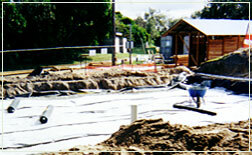 Trine Solutions - Specialists in Domestic and Commercial - low cost wastewater treatment systems. Trine Solutions is a small family company run by Bradford, Marrianne and Ché Nicholson. Why the name Trine Solutions? Trine - (meaning three) follows the fate of the three basic biochemical transformations that occur on this planet. Solutions - through understanding the biochemical transformations that occur in nature practical solutions are available. The business started in 1998, specialising in the installation of On-site Wastewater Management Systems, Sewage Treatment Plants for both the domestic and commercial application. We soon expanded into the design and installation of specialised methods of wastewater treatment and application, including all aspects of <Plumbing services, drainage and gasfitting. We also expanded our business to include Environmental impact reports for regulatory departments such as Local Government, State Health Departments and the Environmental Protection Agency. In fact our expertise has been recognised by one of the leading companies in Environmental Town Planning "Geolink"
“To understand what degree of wastewater treatment will be required to sustain the environment, it will be necessary to consider the transport and fate of constituents in the environment. Constituents released to the environment are subject to a variety of transport and transformation processes and operations that can alter their composition”. Trine... meaning 3 - follows the fate of the three basic biochemical transformations that occur on this planet. 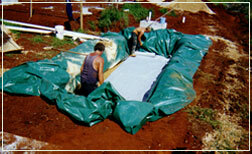 Domestic gravity fed Sand filter under construction.